To Cite: Khazaii T, Taheri F, Hosseini S M, Parhiz Z, Namdari S. The Effects of Preterm Infant Care Education on Stress Among the Mothers of Preterm Infants Hospitalized in Neonatal Intensive Care Units, Mod Care J. 2018 ; 15(1):e69476. doi: 10.5812/modernc.69476. Background and Objectives: Hospitalization in neonatal intensive care unit (NICU) causes mothers high levels of stress and endangers maternal and infantile health. The current study aimed at examining the effects of preterm infant care education on stress among the mothers of such infants hospitalized in NICU. 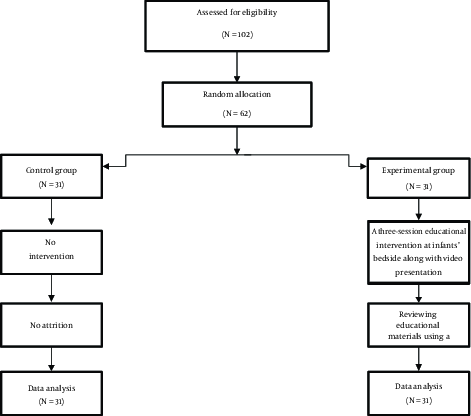 Methods: The current randomized, controlled trial was conducted in 2017 on a convenience sample of mothers whose preterm infants were hospitalized in the NICU of Vali - e - Asr teaching Hospital, Birjand, Iran. Mothers were randomly assigned to either the control or experimental group through the drawing method. Mothers in the experimental group received preterm infant care education plus routine care services, while their counterparts in the control group only received the routine care services. All of them completed the parental stressor scale: NICU both before and 10 days after the intervention. For data analysis, the paired - samples t, the independent - samples t, the Mann - Whitney U, and the Wilcoxon tests were used with SPSS version 19.0. Results: Ten days after the intervention, no significant intragroup differences were observed regarding the mean scores of the two domains of maternal stress; i e, infants’ appearance and behaviors and maternal relationships with infant (P > 0.05). However, the mean scores of maternal stress and its environmental domain in the experimental group were significantly lower than those of the control group (P < 0.05). In addition, the pretest - posttest mean differences of maternal stress and all its domains in the experimental group were significantly greater than those of the control group (P < 0.05). Conclusions: Preterm infant care education to mothers significantly alleviated their stress. Educational hospital managers can improve maternal and infantile outcomes through facilitating maternal education about preterm infant care. A preterm birth is the birth of an infant before the gestational age of 37 weeks (1). Each year, around 15 million preterm infants are born in the world (2). After birth, these infants need hospitalization in neonatal intensive care units (NICUs) to receive advanced care services (3). NICU hospitalization is greatly stressful for mothers and can endanger maternal health and negatively affect mother - infant attachment (4). The most significant sources of maternal stress are constant lighting, continuous monitoring systems, unpleasant odors, numerous equipment connected to infants, different healthcare providers surrounding infants (5), conflicts in parental roles (6), infants’ small body size, shallow breathing, and weak cry (7). High maternal stress is associated with different problems. A study reported that 77% of mothers whose infants were in NICU had obvious manifestations of psychological trauma for one month and 49% for even one year after preterm birth (8). Unmanaged maternal stress during NICU stay can weaken mothers’ attachment to their infants, and thereby damage both mothers and infants (9). High maternal stress and its negative effects on mothers and infants highlight the importance of education and support for mothers (10). A study showed that answering parents’ questions and fulfilling their educational needs improve their relationships with their infants and their satisfaction with NICU hospitalization (11). Moreover, educational programs can promote mothers’ adaptation, alleviate the stress induced by preterm birth, improve their functioning, strengthen their relationships with their preterm infants, and improve their attitudes towards parental roles (12). Nonetheless, there are controversies over the effects of educational - supportive programs on maternal stress. For example, a study showed the insignificant effects of an educational program on maternal stress (13), while another reported the effectiveness of an empowerment program in alleviating parental stress (14). On the other hand, many studies are conducted so far on the sources of maternal stress; however, there are limited studies on stress - reducing interventions. The current study aimed at narrowing these gaps by examining the effects of preterm infant care education on stress among the mothers of infants hospitalized in NICU. Eligible mothers were conveniently recruited. Inclusion criteria were no history of preterm birth, ability to read and write in Persian, no history of hospitalization for mental disorders such as anxiety and depression, a preterm infant with a birth weight of < 2500 g, a gestational age of less than 37 weeks, and no congenital deformity. Mothers were excluded if they withdrew from the study or their infants died or were discharged from NICU during the study. Each mother was randomly assigned to either the control or experimental group through randomly selecting one of the two cards labeled A or B. Recruited mothers were given complete explanations about the study and their informed consents were secured. Two instruments were used for data collection. The first was a demographic questionnaire with items on mothers’ age, educational status, employment status, route of delivery, type of hospital attendance, pregnancy unwantedness, having other children, and infant’s age and gender. The second instrument was the parental stressor scale: neonatal intensive care unit (PSS: NICU). PSS: NICU was developed by Miles et al., in 1993 and includes 34 items in three domains, namely NICU environment, infant’s appearance and behaviors, and parental relationships with infant. The first domain includes items on environmental sounds, monitoring systems, equipment, and the presence of other infants in NICU, etc. The items of the second domain include apnea, sudden alteration in skin color, flaccid and fragile appearance, connection to tubes and equipment, etc. The third domain items include separation from infant, feeling of frustration in protecting infant against pain and painful procedures, inability to personally feed infant, etc. Items are scored using a six - point Likert - scale as follows: 0: Not applicable; 1: Not stressful; 2: Slightly stressful; 3: Moderately stressful; 4: Very stressful; and 5: Extremely stressful. The total score of PSS: NICU ranges from 0 to 170, with higher scores representing higher levels of parental stress. An earlier study in Iran reported a Cronbach’s alpha of 0.87 for the Persian version of PSS: NICU (7). All participants completed the study instruments 24 hours after their infants were admitted to NICU. Then, mothers in the experimental group were educated by the first author in 30- to 45-minute sessions held at infants’ bedside for three consecutive days. Education was provided individually and face - to - face. After each session, a 45 - minute video was showed for the intended mothers, which contained the provided materials. Mothers were also given an educational booklet containing the same issues. The educational materials were about handwashing before contacting the infant, appropriate infant clothing, optimum environmental conditions for a preterm infant, feeding through gastric tube, ideal weight gain criteria, bathing the infant, the importance of embracing and touching the infant, equipment used for the infant, and infant’s breathing pattern and appearance. Mothers in the control group received routine care services. All participants in the two groups recompleted the study instruments 10 days after the intervention. The collected data were analyzed with SPSS version 19. Initially, the chi - square test was run to compare the groups concerning participants’ demographic characteristics. Then, the Kolmogorov - Smirnov test was used to test normal distribution of the study variables. Accordingly, normally - distributed variables were analyzed using the paired- and the independent - samples t tests, while variables with non-normal distribution were analyzed by the Mann - Whitney U and the Wilcoxon tests. In total, 62 mothers completed the study (Figure 1). The means of mothers’ age, infants’ gestational age, birth weight, and NICU stay were 28.68 ± 6.43 years, 29.71 ± 1.9 weeks, 1499.52 ± 463.82 g, and 10.11 ± 6.61 days, respectively. Most mothers were housewives (N = 50; 80.6%) and the rest were employed (N=12; 19.4%). The groups did not significantly differ from each other regarding mothers’ demographic characteristics (P > 0.05; Table 1). Before the intervention, there were no significant differences between the groups concerning the mean scores of maternal stress and its domains (P > 0.05). Moreover, 10 days after the intervention, no statistically significant differences were observed between the groups concerning the mean scores of the two domains of maternal stress, i e, infants’ appearance and behaviors and maternal relationships with infants (P > 0.05). However, the mean scores of maternal stress and its NICU environmental domain in the experimental group were significantly lower than those of the control group (P < 0.05). Besides, the pretest - posttest mean differences of maternal stress and all its domains in the experimental group were significantly greater than those of the control group (P < 0.05; Table 2). aIndependent - samples t test. bMann - Whitney U test. dPaired - samples t test. The current study assessed the effects of education on stress among the mothers of preterm infants hospitalized in NICU. The study findings indicated that after the intervention, the mean scores of maternal stress and its NICU environment in the experimental group were significantly lower than those of the control group, while there were no significant intragroup differences regarding the mean scores of the other two domains of maternal stress. Moreover, the pretest - posttest mean differences of maternal stress and all its domains in the experimental group were significantly greater than those of the control group. These findings denoted the positive effects of education on maternal stress among the mothers of preterm infants hospitalized in NICUs. In line with the current study findings, a study in Turkey showed the effectiveness of a one - session educational program in significantly alleviating parental stress among the fathers and the mothers of preterm infants (16). Similarly, a study in Norway found the positive effects of education on parental stress after preterm birth (17). Another study in Canada reported that an educational - behavioral intervention was effective in significantly alleviating parental stress in NICUs, strengthening parents’ relationships with their infants, and improving their attitudes towards their parental roles (18). However, the current study findings contradicted with the findings of some previous studies. For instance, a study in Germany showed that education had no significant effects on maternal stress (13). This contradiction may be due to the lengthy intervals between educational sessions and the provision of educations through classic lectures in that study. Another study also reported the ineffectiveness of lecture - based education to alleviate maternal stress (19). This contradiction can also be attributed to the provision of education through lectures without providing mothers with written materials. One strength point of the current study was the provision of educating mothers through bedside lectures, video clips, and educational booklets. Another strength point of the study was the onset of education just one day after NICU admission. However, the long - term effects of the intervention could not be assessed. Thus, future studies are recommended to assess the long - term effects of educational interventions on maternal stress. Comparison of the effects of lecture-, video-, and booklet - based education may be another area of further study. The results of the current study indicated the effectiveness of education on stress among the mothers of preterm neonates hospitalized in NICUs. Educational and emotional support for parents can reduce their stress and help them use their energy to provide care to their infants, instead of dealing with stress. NICU head - nurses and educational hospital managers are recommended to develop and pursue policies to educate the mothers of preterm neonates in NICUs as well the staff in NICUs. The article was part of a research project approved by Birjand University of Medical Sciences, Birjand, Iran (approval code: IR.BUMS.REC.1395.272; approval date: 13.02.2017). Authors appreciate the help and support provided by the Research Administration of the University as well as Mrs. Zarei, the head - nurse of the study setting. 1. Ryan-Wenger NA. Core curriculum for primary care pediatric nurse practitioners. Mosby; 2007. 2. Blencowe H, Cousens S, Oestergaard MZ, Chou D, Moller AB, Narwal R, et al. National, regional, and worldwide estimates of preterm birth rates in the year 2010 with time trends since 1990 for selected countries: a systematic analysis and implications. Lancet. 2012;379(9832):2162-72. doi: 10.1016/S0140-6736(12)60820-4. [PubMed: 22682464]. 3. Korja R, Latva R, Lehtonen L. The effects of preterm birth on mother-infant interaction and attachment during the infant's first two years. Acta Obstet Gynecol Scand. 2012;91(2):164-73. doi: 10.1111/j.1600-0412.2011.01304.x. [PubMed: 22007730]. 4. Ambalavanan N, Carlo WA, McDonald SA, Yao Q, Das A, Higgins RD, et al. Identification of extremely premature infants at high risk of rehospitalization. Pediatrics. 2011;128(5):e1216-25. doi: 10.1542/peds.2011-1142. [PubMed: 22007016]. 5. Montirosso R, Provenzi L, Calciolari G, Borgatti R, Neo-Acqua Study Group . Measuring maternal stress and perceived support in 25 Italian NICUs. Acta Paediatr. 2012;101(2):136-42. doi: 10.1111/j.1651-2227.2011.02440.x. [PubMed: 21827551]. 6. Akbarbegloo M, Valizadeh L, Asadollahi M. Comparison ofThe view of nurses and mothers in sources of stress of parents of Hospitalized prematur Newborns in Neonatal Intensive Care Units. J Urmia Nurs Midwifery Facul. 2010;21(74):6-11. Persian. 7. Sarajarvi A, Haapamaki ML, Paavilainen E. Emotional and informational support for families during their child's illness. Int Nurs Rev. 2006;53(3):205-10. doi: 10.1111/j.1466-7657.2006.00479.x. [PubMed: 16879183]. 8. Jotzo M, Poets CF. Helping parents cope with the trauma of premature birth: an evaluation of a trauma-preventive psychological intervention. Pediatrics. 2005;115(4):915-9. doi: 10.1542/peds.2004-0370. [PubMed: 15805364]. 9. Franck LS, Cox S, Allen A, Winter I. Measuring neonatal intensive care unit-related parental stress. J Adv Nurs. 2005;49(6):608-15. doi: 10.1111/j.1365-2648.2004.03336.x. [PubMed: 15737221]. 10. Abdeyazdan Z, Shahkolahi Z, Mehrabi T, Hajiheidari M. A family support intervention to reduce stress among parents of preterm infants in neonatal intensive care unit. Iran J Nurs Midwifery Res. 2014;19(4):349-53. [PubMed: 25183973]. 11. Sepehri nia M. The Importance of Relationship between Nurses and Mothers of Neonates Admitted to Neonatal Care Units. National Congress for the Promotion of Newborn Health. Mashhad University of Medical Sciences. 2012. 12. Jafari Mianaei S, Alaee Karahroudy F, Rassouli M, Tafreshi Zagheri M. The effect of Creating Opportunities for Parent Empowerment program on maternal stress, anxiety, and participation in NICU wards in Iran. Iran J Nurs midwifery Res. 2014;19(1):94-100. Persian. 13. Glazebrook C, Marlow N, Israel C, Croudace T, Johnson S, White IR, et al. Randomised trial of a parenting intervention during neonatal intensive care. Arch Dis Child Fetal Neonatal Ed. 2007;92(6):F438-43. doi: 10.1136/adc.2006.103135. [PubMed: 17301114]. 14. Melnyk BM, Feinstein NF, Alpert-Gillis L, Fairbanks E, Crean HF, Sinkin RA, et al. Reducing premature infants' length of stay and improving parents' mental health outcomes with the Creating Opportunities for Parent Empowerment (COPE) neonatal intensive care unit program: a randomized, controlled trial. Pediatrics. 2006;118(5):e1414-27. doi: 10.1542/peds.2005-2580. [PubMed: 17043133]. 15. Borim Nejad L, Haghghani H, Mehrnosh N, Seyyed Fatemi N. Maternal Stressor Agents with Premature Infants in Neonatal Intensive Care Units. J Crit Care Nurs. 2011;4(1):39-44. Persian. 16. Turan T, Basbakkal Z, Ozbek S. Effect of nursing interventions on stressors of parents of premature infants in neonatal intensive care unit. J Clin Nurs. 2008;17(21):2856-66. doi: 10.1111/j.1365-2702.2008.02307.x. [PubMed: 18637857]. 17. Kaaresen PI, Ronning JA, Ulvund SE, Dahl LB. A randomized, controlled trial of the effectiveness of an early-intervention program in reducing parenting stress after preterm birth. Pediatrics. 2006;118(1):e9-19. doi: 10.1542/peds.2005-1491. [PubMed: 16818541]. 18. Ballantyne M. An educational-behavioural intervention for parents of preterm infants reduced parental stress in the NICU and infant length of stay. Evid Based Nurs. 2007;10(2):41. doi: 10.1136/ebn.10.2.41. [PubMed: 17384093]. 19. Ahn YM, Kim MR. The effects of a home-visiting discharge education on maternal self-esteem, maternal attachment, postpartum depression and family function in the mothers of NICU infants. Taehan Kanho Hakhoe Chi. 2004;34(8):1468-76. [PubMed: 15687789].